“The functional destruction of critical facilities and weaponry has taken place… We’re in full swing to prepare for the removal of the most critical chemical agents out of the country,” Special Coordinator Sigrid Kaag told the UN News Service just prior to briefing the Security Council on the latest developments. The Joint Mission was set up two months ago to achieve the timely elimination of the Syrian chemical weapons programme in the safest and most secure manner possible – by 30 June 2014 – in accordance with the decisions of the Security Council and OPCW Executive Council. Ms. Kaag said preparations are under way for “Phase III”, namely the removal of chemical agents out of the country. The plan is to transport the chemical agents to the Syrian port city of Latakia, where they will be shipped on commercial vessels provided by some Member States. They will then be loaded onto a United States ship and destroyed at sea using hydrolysis. She noted that the exercise requires a number of components such as packaging material, logistics, special trucks and containers, as well as training Syrian staff in packing the chemicals to meet international maritime regulations concerning hazardous goods. “Above all, the security conditions in country are such that it’s an ongoing concern and it could also at any time derail our ability to meet deadlines,” she stated. In a letter sent to the Security Council on the issue, UN Secretary-General Ban Ki-moon pointed out that the recent fighting in Syria shows that the security situation is “volatile, unpredictable and highly dangerous.” He added that implementation of the Joint Mission’s mandate cannot occur without conditions inside Syria that are conducive to carrying out its tasks. The violence in Syria is continuing unabated since fighting first broke out in March 2011 between the Government and opposition forces seeking the ouster of President Bashar Al-Assad. The conflict has already claimed over 100,000 lives and driven over 6 million people from their homes. There are security constraints when it comes to the transportation of the chemicals overland in Syria, the Special Coordinator reiterated to the press after her closed-door briefing to the Council. One example, she said, is the road connecting Damascus and Homs – a main artery in the country. “If we cannot travel there, it is a real issue.” She herself had to travel by helicopter through Lebanon to reach Latakia recently to be able to inspect the port and consult with officials. Her briefing to the 15-member Council also touched on “the what and how” in terms of the work of the Joint Mission, the continuous volatile conditions in the country, the security measures that need to be undertaken, and the “constructive cooperation” with the Syrian authorities, she said. 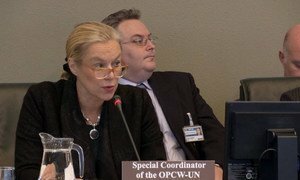 Ms. Kaag stressed that financial assistance has been critical, voicing gratitude for the generosity of donors to the two trust funds set up by the OPCW and the UN to fund the mission’s activities. “But much more is needed,” she stressed in the interview, calling on the international community to support the special third trust fund set up for the complete destruction of the chemical agents and the resulting effluence.